Your Facebook Messenger Campaigns are very likely to be your most successful tool for recovering abandoned carts and retaining your customers. Therefore, using the right Messenger growth tools is essential. This is why we created the Messenger Add to Cart Popup. Why use the Messenger Add to Cart Popup? 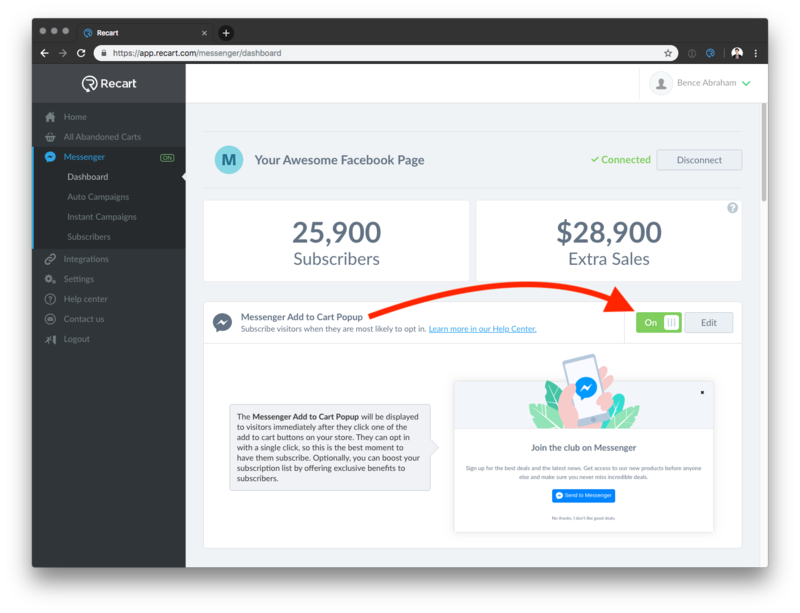 The Messenger Add to Cart Popup will be displayed to your customers when they are most likely to subscribe to your Facebook Messenger Campaigns: When adding an item to their cart. Unlike other popup solutions, which are triggered after a certain amount of time has passed or when a customer wants to leave your store, we catch their attention when they are most interested in doing business with you. This will give you incredibly valuable Messenger subscribers that you can later retarget with Automated or Instant Messenger Campaigns. When someone sees the Messenger Add to Cart Popup, they can do one of 2 things: subscribe or close the popup. In both cases, they will continue the customer journey on your store immediately. Their items will be added to their cart and all further actions that you set up on your store will be done immediately. We made sure that the Add to Cart Popup seamlessly integrates into your customer journey to provide an optimized experience for everyone visiting your store. How to set up the Messenger Add to Cart Poup? Our Messenger Add to Cart Popup will give you around 85% subscription rate. 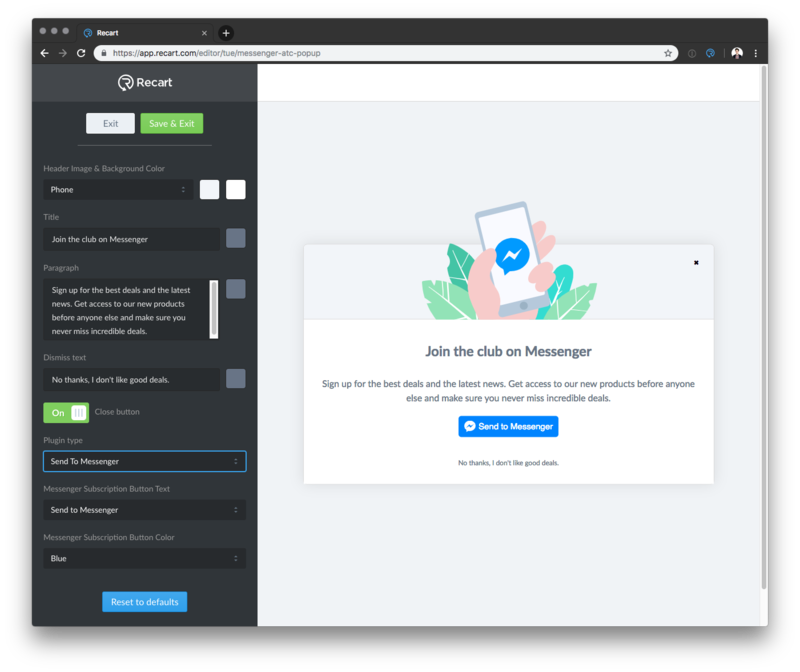 This is an incredible advantage over other popup solutions, and we wanted to make it easy to set up, so you can start using it immediately. First, let's go to your Recart Messenger Dashboard. Here, you can change all your Facebook Messenger Settings, including the settings for the Messenger Add to Cart Popup. To enable the Messenger Add to Cart Popup on your store, simply click the switch and make sure it's On. To change your default settings, click Edit next to the switch to open the Editor for .your Messenger Add to Cart Popup. There are quite a few things that you can change to customize the popup and make the colors match your brand. You can change the header and background colors, edit the heading and body copy, as well as the text colors. You can also decide whether you want to use a checkbox or a button for subscribing your visitors. In general, we recommend sticking to the button, unless your store is approved for the pre-checked checkbox. There also more advanced options, like changing the Send to Messenger Button text or the button colors. If you are not sure which settings to use, please ask our Customer Success team, and we will help you decide. We also give you a choice of 3 beautiful header images to catch the attention of your visitors and build trust. These colorful images were created exclusively for Recart users to give you a beautiful, out of the box solution that looks like you hired a graphic artist yourself. You just need to select the one that fits your use case the most. When you enable the Messenger Add to Cart Popup on your store, it will be shown to both mobile and desktop visitors. Therefore we optimized all designs and assets for mobile browsers in addition to desktops. Our popup is displayed instantly when the visitor clicks on the add to cart button, there is absolutely no loading time to make sure that your Customer Journey is enhanced. Please note: Safari is currently not supported by Facebook Subscription tools. We reported the issue to Facebook and they are working on adding support for Safari. In the meantime, the Messenger Add to Cart Popup will not be shown if the customer is using an unsupported browser. All in all, we are really excited about the new Growth Tool that you can start using today. For Recart, it has always been essential to give you as many subscribers as possible. We have worked hard on our new solution and we can't wait to see what you do with it. If you have any comments or requests, we can't wait to hear from you. One of our goals is to give you the best Growth Tools for your specific needs. Therefore, please get in touch with our Customer Success team and let us know if there's anything you would like to see in future updates.